Course Designer App Now Available! The long awaited Agility1st Dog Agility Course Designer app is now available for both iPad and tablets using Android technology. 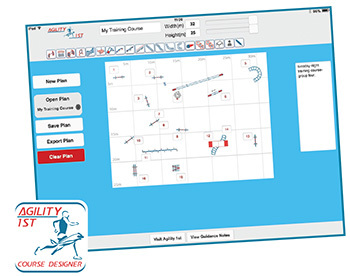 The Agility1st Course Designer App allows you to design both full courses and short training sequences on your tablet. Courses can be exported and saved to your camera roll for you to then print or email. Course size go up to 40 sqm. Provision for two sets of numbers (red and blue) to allow for pairs courses. A notes section allows you to record details such as course times or observations from your training sessions.